The CN Tower is one which prominently stands out across the skyline of the downtown area of the city of Toronto from a viewpoint at Ontario Place. The tall skyscrapers appear small against the CN tower and the marina looks minuscule as it extends out into the waters of Lake Ontario. The fast pace of the city of Toronto begins to slow down as the sunset colors decorate the sky sending people home after another busy day. Toronto is the provincial capital of Ontario with an estimated 2.5 million permanent residents which makes it hard to believe that the city looks so peaceful in this picture. Skyline of Toronto City seen from Ontario Place, Toronto, Ontario, Canada at sunset. 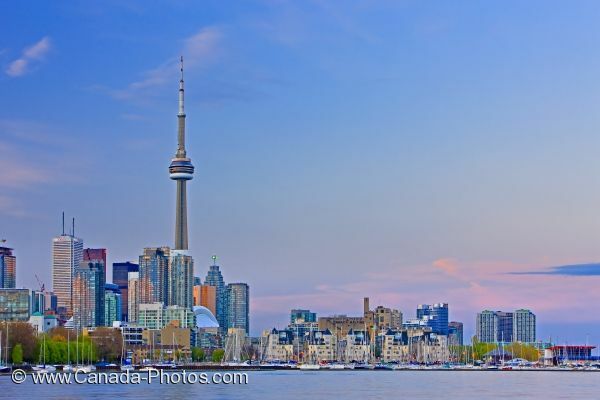 Picture of the sunset skyline of the downtown area of the City of Toronto, Ontario as seen from Ontario Place.